Jeffrey Olpphant is a defendant in the WaterWarCrimes lawsuit because he is alleged to have wrongly and improperly shut down an inquiry into judicial malfeasance in British Columbia and to have blocked communication between a citizen of Canada and the Canadian Judicial Council. 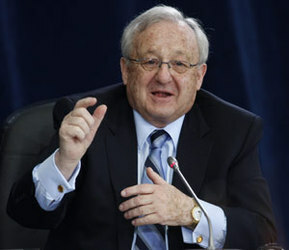 Canadians were relying upoin Justice Jeffery Oliphant to give them the straight goods arsiing from the Mulroney Schrieber Inquiry but there is reason to believe that Jeffery Oliphant was part of a cover up because he willingly participated in a cover up crimes in the past and, the general rule is, a leopard is does not change its spots. 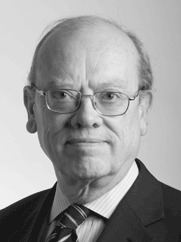 In February 2000, Jeffery Oliphant was a member of the Canadian Judicial Council when Council members Jeannie Thomas and Allan McEachern lied to the Canada public by falsely denying that any complaints had been filed or investigations carried out in respect of the conduct of British Columbia Supreme Court Chief Justice Bryan Williams prior to his sudden resignation in the first week of February 2000. When correspondence and telephone calls were made to the Canadian Judicial Council referring to the complaints filed, in writing, by legal counsel for Sun Belt Water Inc, concerning Mr. WIlliams and the investigation carried out by Professor Ratushney of Ottawa University Law Faculty, the Canadian Judicial Council closed the file on the diretion of Jeffery Oliphant, who, according to Council executive director Jeannie Thomas, instructed the Council staff not to respond to any communications from legal counsel for Sun Belt Water Inc. The conduct of Justice Oliphant was and outrageous affront to the public interest and, in the opinion of the editors of this web site, was a deliberate interference in the due administrartion of justice carrying a penatly of 14 years imprisonment.. The Candian Judicial Council had a legislated mandate to investigate complaints about judges and its staff were refusing to do their jobs of investigating complaints becauyse of the direction of Jeffery Oliphant. Private investigations carried out into the background of Jeffery Oilphant revealed he had been a prominent Progressive Conservative Party member in the 1980's and had been expected to run for political office in the area of Brandon, Manitoba, when his election prospects were greatly diminshed due to the fact that he acted as defence counsel for a local gentleman accused of murder. The general public beleived the man was guitly but Mr. Oliphant got him off and, as a consequence, Mr. Oliphant's popularity with the general pulbic declined greatly. Mr. Oliphant was made a judge of the Manitoba Court of Queens Bench in 1985 by the federal government of Canada under Prime Minister Brian Mulroney. 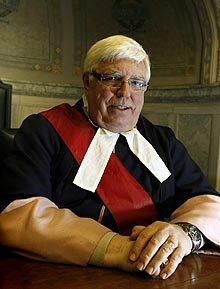 He was appointed Associate Chief Justice of the Manitoba Court of Queen Bench by Prme Minister Brian Mulroney in 1990. He presided over the inquiry into the Mulroney Shcrieber Affair in 2009. If Jeffery Oliphant would order Canadian Judicial Council staff to shut down an inquiry into judicial misconduct by a Chief Justice appointed by the Liberal Party of Canada, it is a safe bet that he did a crooked job when carrying out the inquiry into the conduct of Prime Minister Brian Mulroney who appointed him to his well paying job as a Justice of the Manitoba Court of Queen's Bench. For many months Martin Mason represented Jeffrey Oliphant in the Water War Crimes lawsuit filed by Mr. Carten and Ms. Gibbs. Then he suddenly dropped dead and there is good reason to suspect he was murdered. Mr. Mason worked for Gowlings - a big Canadian law firm - and his partner at the Toronto branch of Gowlings was the former British Columbia Attorney General Brain Smith. Three of Mr. Smith's subordinates, in September 1989, have died from sudden heart attack while in appearent good health. Robert Edwards, the Deputy Attorney General of British Columbia, when that office gave illegal benefits to W.C.W. Western Canada Water Enterprises Ltd., dropped dead on November 5, 2007. Click here to go to the Graveyard of the Wicked to learn about Robert Edwards. Jack Ebbels, who the senior lawyer who was in charge of the legal file that gave the illegal benefits to W.C.W. 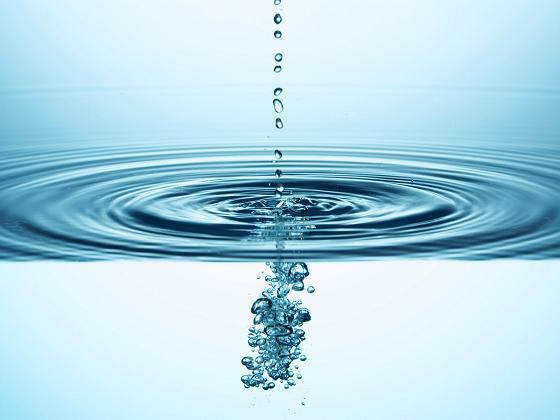 Western Canada Water Enterprises Ltd. and who dropped dead on Febraury 25, 2010 from a heart attack while skiing. James Taylor, who ins 1989 was an obscure prosecutor employed by the Ministry of the Attorney General in British Columbia but who was appointed to be a judge in 1995 by Prime Minister Chretien's government and who, in 2001, was assigned to a case involving Mr. Carten's family law proceeding and who made perverse rulings against Mr. Carten intended to prevent him re-establishing his law practice. Mr. Taylor dropped dead on January 10, 2010 while at his ski cabin. In all three cases, murder is suspected because of the timing of their deaths, teh sudden nature of their death and the fact that they knew too much about the crimes carried out. 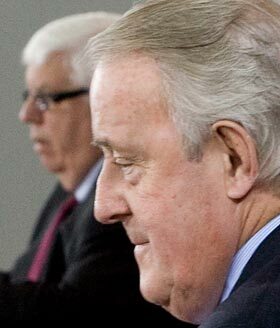 This web site takes no position on the affairs of Mr. Mulroney or Mr. Shcrieber and the cash payments made to Mr. Mulroney by Mr. Schrieber that were reviewed by Jeffrey Oliphant at the public inquiry held in 2009 but questions the wisdom of the selection of Jeffrey Oliphant to carry out the inquiry. 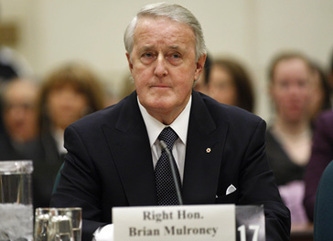 However, given Mr. Oliphant's efforts to suppress an inquiry into the truth, as he did in 2000, when the Canadian Judicial Council was asked to investigate the conduct of Chief Justice Bryan Williams, it is reasonable to think that Mr. Oliphant was selected to suppress the truth again in the Mulroney Schrieber inquiry?